I have had a few people ask for more information on my Whole30 so I decided to do a little mini series on what I learned, what I eat, ect. Going through it was such a great experience and I learned so much that I thought it would be great to put it in one place for reference. My husband and I are still eating mostly Whole30 meals with only a few adjustments here and there. It is pretty hard to stop eating this way when we both feel so great and we are both not yet at our goal weights. Additionally the end goal here is to hopefully help improve our fertility. We have both been really considering what we eat (if it’s off plan). Sometimes we treat ourselves, but we don’t make those decisions lightly. Sometimes it’s just not worth it to indulge and sometimes it is. In my first few posts I am going to focus on preparing for Whole30. It may not seem like a big deal, but if you want to be successful I would highly recommend spending some time preparing. This includes researching Whole30 compliant recipes which sound good to you, making a meal plan for your first week, and stocking your kitchen appropriately. There is currently a shelf in my pantry dedicated to only Whole30 friendly foods. 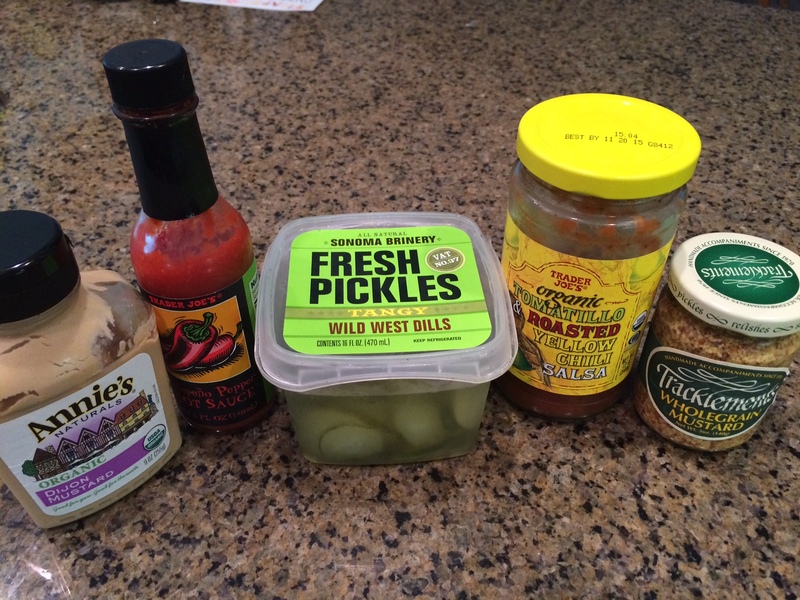 In this post I will focus on some pantry items which I find to be key in Whole30 cooking. First is the cooking fats. 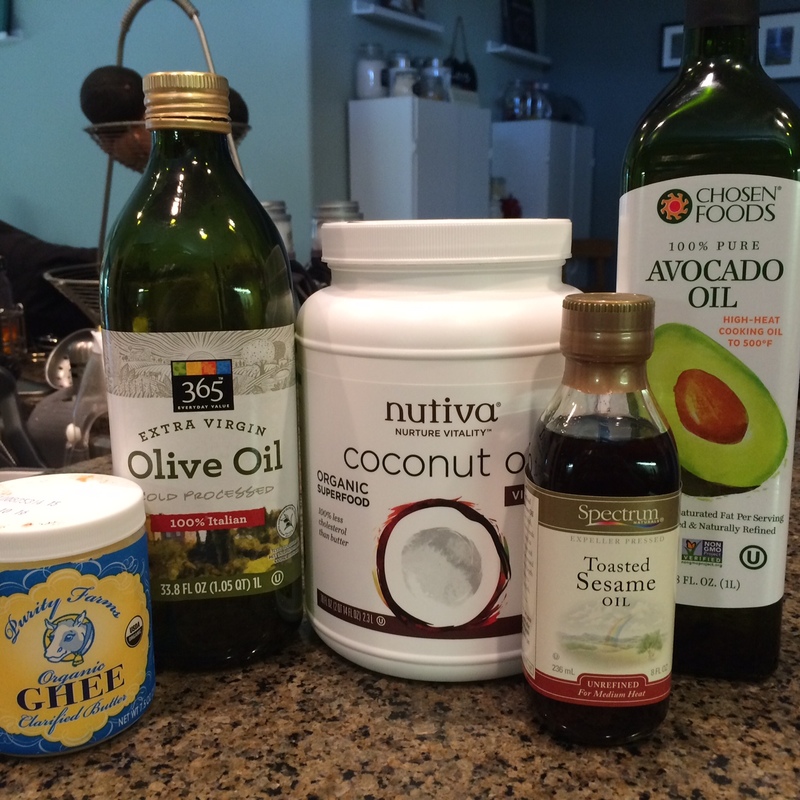 Coconut oil, Ghee (clarified butter), and olive oil are by far the most important three fats to have on hands. Almost every Whole30 recipe includes one of these and they are all unrefined and good for you. If you want more info on how this kind of fat is good for you, I highly recommend that you read “It Starts With Food”. Actually I highly recommend that you ready it if you are going to do Whole30 in general but more on that later. I also stock avocado oil because I make my own mayo and this is a key ingredient. Finally I also have some sesame oil, which should be used in moderation but can give food a delicious and powerful flavor. I buy avocado oil and coconut oil at Costco. It is much much more economical to buy it there than at a grocery store. My next set of must have items include the vinegars and a few other special items. 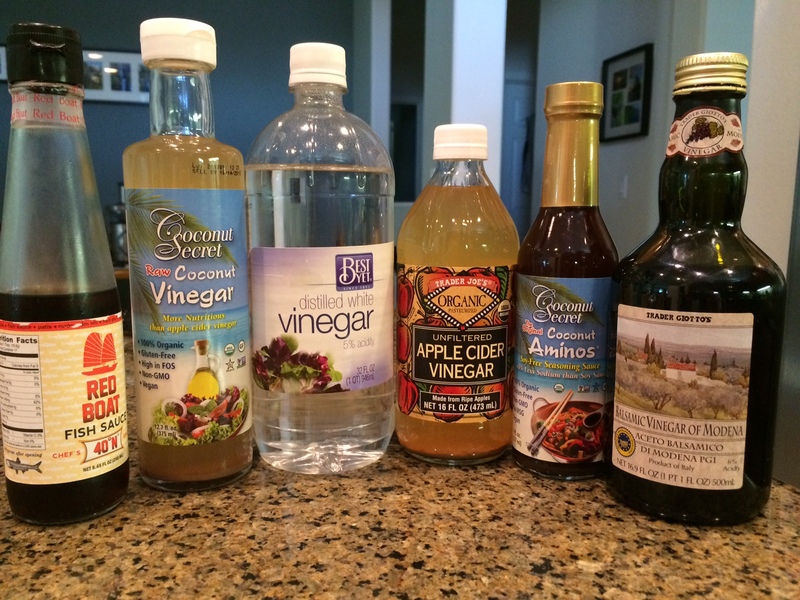 I would highly recommend that you stock balsamic vinegar coconut vinegar, and apple cider vinegar. They are common ingredients in many Whole30 recipes. Additionally having coconut aminos on hand is a great idea as it is a substitute for soy sauce and also a common ingredient. Finally Whole30 Fish sauce such as Red Boat appears in lots of recipes. Just a little goes a long way with this one, and it doesn’t have a great smell, but it does add great flavor. Finally below are some of the condiments we keep. Compliant hot sauces and salsa were super important for my husband and I as we like things on the spicy side. We also found having Dijon and whole grain mustard (without sugar-check labels!) on hand was helpful. Finally finding compliant pickles was huge for me! When I first started shopping took forever. You literally have to check every label because they sneak preservatives and sugar into everything! I was excited to find compliant salsa and hot sauce at Trader Joe’s both for cheap! The salsa is also organic! All in all I found that I did a combination of shopping at Costco, Whole Foods, Sprouts, and a local grocery chain called The Nugget to full stock my house. Obviously you do not need to go out and get EVERYTHING on my list but hopefully you found some of this information helpful! The Whole30 is serious business. There are a lot of things you have to cut out of your diet. Things that are not necessarily bad for you such as legumes or dairy. The point is that you cut them out, and then after they are totally out of your system you try them again and see how your body reacts. I like the idea behind this method. I mean for my entire 32 years on the planet I have never really known how foods like gluten, legumes, or dairy effect my body so there is really only one way to find out. What you do have to cut out, which is definitely not healthy for you, is sugar (EXCEPT FRUIT). This is honestly the hardest part, but not because I am craving doughnuts, cupcakes, candy, or the like. It is because sugar is hiding in very unlikely places. When you really start to read labels you will be shocked to see how sugar sneaks in to your diet. I actually am to the point that I wanted to do cart wheels in Costco on Saturday because I found a sausage without preservatives that was only sweetened with apple juice. Honestly finding something in a package that is “quick” to prepare that meets the criteria is like finding gold. Here are some of the things which have totally shocked me to have sugar in them! 99% of all lunch meat. Thus far I have found one lunch meat that complies (Applegate Farms Organic Roast Beef). Everything else either has sugar in the form of cane sugar, raw sugar, dextrose, honey ect in it, or Carragean (also not allowed) or usually both. Beef Broth- I have yet to find a beef broth without sugar added. I ended up having to make two batches of chili for the super bowl I went to over the weekend because the original recipe called for beef broth and half way through cooking I read the label. I make my own chicken broth so I am not sure if packaged chicken broth also contains sugar but I would not be surprised. Bacon and other processed meat. I was able to find one kind of bacon at Whole Foods which does not have sugar. And then I stumbled upon the chicken apple sausage over the weekend. I also found one type of cold smoked salmon at whole foods. These finds were huge. Almost all packaged condiments. Finding whole grain and Dijon mustard without sugar was even a huge challenge. I have learned to make a few condiments that are pretty good such as mayo and “ranch” dressing (the whole30 version is also dairy free). Dry seasoning packs and store bought rubs. Not all but a great majority of dry seasoning packs contain sugar and preservatives. I needed some ranch seasoning over the weekend and was able to make it myself with spices from my kitchen. It was delish without on the unnecessary sugar and chemicals. I do not go around blabbing to everyone about my Whole30. Only when people specifically ask to I offer the details of what I am doing and why. When I do begin to explain the “rules” no one seems particularly shocked that I have cut out sugar (except fruit), but when the conversation comes around to honey, and I tell them that is also not allowed, they get almost offended. I cannot even tell you how many times I get the reaction “WHAT! You can’t have HONEY?!?! That is just crazy!” Why is it that this seems so outlandish to people? I mean honey is sugar. Of course the very next thing that comes out of their mouth is the argument that honey is natural. While I actually have several talking points on why something that is natural (ie from Nature) does not necessary mean it’s good for you or that you should have it, I do not take that road. I am certainly not trying to get in an argument over honey and food can be a controversial topic these days. What I do say, however, is the people who developed the Whole30 program said honey is not allowed. I have (by my own freewill) decided to try the Whole30 100%, so while I am doing it, I won’t be having honey. It’s a rule of the program and I respect that. It doesn’t mean I think honey is bad or good (or dairy or legumes or grains or anything else not allowed). It means that I am following a program, and the program is REALLY working for me. I have been alive for over twelve thousand days, and I promise I will be ok not having honey for just 30 days. If anything this 30 days has taught me how much sugar I unknowingly consume on a regular basis. It’s scary. I am totally not against having sugar in moderation (when you are not doing Whole30 of course), but I like my sugar where I can see it, in a cookie. I don’t want it hiding in my soup, meat, or salad dressing. Today is Whole30 day 25. Honestly, I have never felt better. I have incredible energy and I am sleeping better than I ever have in my life. The most amazing thing is that when I wake up in the morning, I am ready to go. I have never been a morning person and I can just pop up out of bed. All of the extra energy has helped me stay caught up with household chores during the week which has kept my stress down. I eat until I am full, and that usually gets me to the next meal without a dip in energy or feeling hunger. Occasionally I snack on a piece of fruit or a few nuts, but not nearly as much as when I started. People have also started to comment on my weight loss. The only thing I miss is the experience of my latte. Starbucks totally came through for me and is going to offer coconut milk starting later this month so I can continue to avoid dairy as much as possible! When I started this I was very determined but also worried about how hard it would be to actually do it. Traveling for work and get togethers with friends felt really intimidating. Now that I am 5 days away from actually doing a full 30 days with NO cheating, I will say it was easier than I thought. Every time I had a week moment I just thought about how great I was feeling and how horrible I felt at the beginning and it just never seemed worth it.